Film is much more durable than paper and will not tear easily. The high durability provides longer product life and even surface provides outstanding finish. Film is the best choice for dry and wet sanding applications. Why TigerShark Film Abrasives ? TigerShark Film is made with premium grain, strong resin bond, and special stearated coating. This provides superior performance and life. TigerShark Film's premium grain and strong resin bond provide faster and sharper cutting performance and longer life than competitors' products. Film backing is very strong and durable. 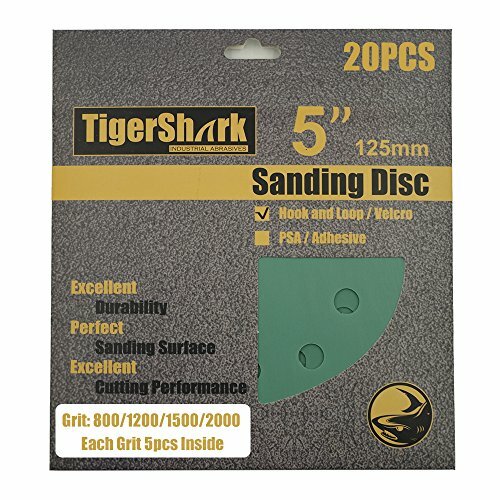 It does not tear easily during sanding operation and is great for edges, corners, and irregular shapes. With uniform mineral coating on perfectly even surface, film works better than paper. The result is outstanding finish without deep scratch marks. Special resin over resin adhesion technology reduces shelling problems. Film back is best choice for dry and wet sanding applications make outstanding surface finish. If you have any questions about this product by TigerShark, contact us by completing and submitting the form below. If you are looking for a specif part number, please include it with your message.